With a full range of family dentistry, cosmetic dentistry, and restorative dentistry options, we can make any desired smile possible. Our kind, professional, knowledgeable, and gentle dental team is here to make your visits with Dr. Elena Kurz at Kurz Family and Cosmetic Dentistry enjoyable and comfortable. We will make sure that you understand all of your treatment options so that you can make educated decisions about your dental care. Please contact our dental office today to learn more about us and to schedule an appointment with our dentist in Dacula, Georgia. ClearCorrect is the clear alternative to traditional metal braces, providing patients with the same great results, but with many more benefits. Our dental office is excited to offer Botox for both facial aesthetics and to help treat TMJ pain! Patients who have lost a tooth or even a jaw full of teeth can benefit from dental implants. We offer a variety of cosmetic dentistry options to suit all of our patient’s needs! While it might surprise you to learn that dentists have been using lasers for more than two decades, you might even be more amazed to learn how advanced lasers have become. "Very professional and polite! The waiting room is very comfortable, they have a beverage bar while you wait! I love that it's a multicultural office, I feel very comfortable when I am there and the hygienist take there time and do it right. I found this office by reading reviews and it payed off! I am very impressed! !" "Today's dental checkup and cleaning was fantastic! Angela (new dental hygienist) at Dr. Kurz was WONDERFUL! She used some great technology to clean the tartar off my teeth reducing the pick time! She was caring and so professional! Best experience today at the dentist. Highly recommend this dental office." Dr. Elena Kurz graduated from Boston University in 2003 with a DMD degree and has also become a member of the healthcare organization AAFE (American Association of Facial Esthetics). After working as an associate dentist in practices in Lawrenceville and Winder, she started her private practice in 2007. 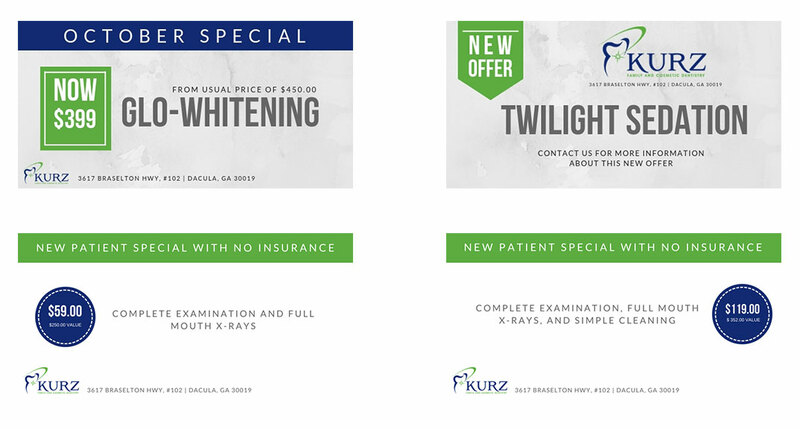 As an experienced Dacula dentist, Dr. Kurz is devoted to taking a compassionate approach to dentistry with her patients. With continued education and knowledge of the latest, cutting-edge dental techniques and technology, Dr. Kurz provides a wide range of dental services from the most basic to restorative cosmetic dentistry. She is also available for urgent dental needs during and after regular business hours.